You’ll know it when you see it, with its delicate mauve petals and yellow centre, its short stalk rising from the little rosette of green leaves. It’s a little distance back from the sea-cliffs, tucked down in the transition zone between maritime heath and the grassy sward with sea pinks that lies behind. It occurs in patches on a few coastal sites in Orkney, Caithness and Sutherland – and nowhere else in the world. Commoner plants have household names, but this is usually called by its Latin one – Primula scotica. That’s sometimes translated as ‘Scottish primrose’, but it doesn’t look very much like a primrose (Primula vulgaris). True, both plants are Primulas; but so are at least 500 other species. And it’s when we look for its nearest relatives that we get our first surprise. One similar-looking plant is found in parts of the north of England, in hill pastures and on coastal cliff-tops, and also in a very few places in south-east Scotland. It’s called Primula farinosa. A second similar-looking plant is found in two regions of Norway and adjacent parts of Sweden and called Primula scandinavica. Despite the outward similarity, the three Primula plants have deeper differences within – in the cell nucleus. P. farinosa has 9 pairs of chromosomes. That pairing-up is similar to humans, where we each have 23 pairs of chromosomes, one set from each parent. But P. scotica has six copies of each chromosome (to give a total of 54 in all); and P. scandinavica has no less than eight (making a total of 72). So within the cell nucleus, the three species are very different, so much so that repeated attempts to cross P. scotica with P. scandinavica have had no success. How to interpret such differences of plants looking outwardly so similar? The similarities suggest they have come from a common ancestor. The differences suggest they’ve gradually altered, possibly in response to local conditions. The extent of the differences suggests that the changes have taken a long time, so that P. scotica is an ancient plant. And this is where Miss Chandler comes in. Almost a century ago, Miss M.E.J. Chandler was studying deposits from the Barnwell Pit near Cambridge. It was an old gravel pit, the gravel coming from an ancient course of the River Cam. Amongst the material were remains of animals from the last Ice Age – reindeer, mammoth, woolly rhino, horse. These deposits would have formed at a time when the area was cold – but liveable. There were ice sheets not so far away on the North Norfolk coast; but the Cambridge area wasn’t buried in ice. It was more like the tundra of the High Arctic of today – bitterly cold, with conditions at extremes; but with life still possible for the vegetation and animals that had adapted. Amongst the material from the Barnwell Pit were many well-preserved plants of arctic type. In a peat layer, Miss Chandler found a seed which she identified as – Primula scotica. She mentioned it in her paper, ‘The Arctic Flora of the Cam Valley’, published in the Quarterly Journal of the Geological Society of London in 1921. Now it was a very little seed and it was somewhere completely unexpected, many hundreds of miles away from the scattered sites of P. scotica today. But there are several good reasons why we can have every confidence in Miss Chandler’s identification. Marjorie Chandler was in her early 20s, but already well into a career in palaeobotany that would see her become internationally known for her work on ancient seeds and fruits. She had won a scholarship to Newnham College, Cambridge, and obtained first class honours in the natural sciences in 1919. At Cambridge she had been inspired by some brilliant lecturers, and one of them, the geologist J. E. Marr, recommended her in 1920 for an unusual research post – one based in an attic of a house. The attic was in a Hampshire village on the shore of the Solent. The house belonged to Eleanor Mary Reid, who had graduated as a physicist and taught physics and maths at Cheltenham Ladies College. But when she met Clement Reid, her life took a new turn. Clement Reid was a remarkable man, through family circumstances largely self-taught; but he had gone on to become one of the finest geologists of his day. His working life was with the Geological Survey of Great Britain, for whom he drew up geological maps in various parts of the UK. He carried out research into ancient plants and animals and reconstructed past landscapes. In 1913, in his book Submerged Forests, he proposed a radically new picture of the North Sea in Ice Age times – a picture of it as a lost world, a drowned land bridge between England and Europe. The picture has been confirmed over the century since he died. At the peak of the last Ice Age, so much water was locked up in the mass of ice covering northern Britain and Europe that sea level was 100 metres less than today – and the present-day North Sea was dry. An undersea feature such as the Dogger Bank would in those far times have been higher ground on a great plain of grassland and trees. As the ice melted and the sea rose, the Dogger feature would have become first an island, and then the submerged sandbank of today. The whole of the lost world, vanished under the waves, has now been given the name of ‘Doggerland’. Clement Reid, a century ago, put forward the Doggerland hypothesis and built up a map of it which has turned out to be remarkably close to what has been established today. In 1897 – the year Marjorie Chandler was born – Clement Reid married Eleanor Mary Wynne Edwards, and together they published scientific papers and books. She was particularly interested in the fossilised remains of plants, and how remnants of seeds could identify the original plant. When her husband died in 1916, she carried on working in the attic of their home in Milford-on-Sea – and it was here that Marjorie Chandler came in 1920, to begin a collaboration that would become lifelong. For their work on prehistoric plants, they used the British Museum’s collection. Their first book looked in particular at the Isle of Wight. Their second book, published in 1933, studied the fossilised plants of the London clay, showing that the area of London had once been tropical forest. The work was mainly funded by Eleanor Reid herself, from her own private income; Marjorie Chandler also received a small annual grant from the British Museum. There was little to spare for luxuries, and their attic laboratory was icy cold in winter and very warm in summer; but nothing got in the way of the research. Marjorie Chandler identified plants from their seeds and fruits, and the changes in vegetation over time gave new insights into the evolution of plants as well as landscape changes. Eleanor Reid built up pictures of the changing climates of the past. She also devised many new techniques for extracting plant samples from peat and other material. From 1933, it was Marjorie Chandler who was the lead partner in the collaboration. Eleanor Reid continued to work, while gradually taking more time for other activitie, helping the local church and school and reading travel books. She was still cycling into her eighties, and when her health began to decline Marjorie Chandler became her nurse. By now Miss Chandler had developed an international reputation. She herself died in 1983. So when we read of a single seed in the Barnwell Pit in Cambridge, a little seed found in a layer of peat, part of a mass of material from the last Ice Age, we know that the identification of this seed as Primula scotica was a precise one, made by someone with the eyes of a hawk. And on top of that, Marjorie Chandler also had access to seeds of Primula scotica of today, collected by Clement Reid on a visit to Caithness. It’s still a big burden for one little seed to carry, but further confirmation came in the 1950s from Dr H. F. Dovaston of the West of Scotland Agricultural College at Auchencruive. Born in 1916, the same year that Clement Reid had died, he had a wide-ranging interest in plants, from the genetics of tomatoes to rock garden alpines. He was particularly interested in P. scotica and the seed from the Barnwell Pit; and he was able to access it at the Sedgwick Museum in Cambridge. He noted first that it was definitely not Primula farinosa, the north of England Primula, which produced bigger seeds. But the scotica-scandinavica seed differences are much more marginal. So he sought samples of the seeds of both. Colleagues in Bergen and Trondheim sent him seeds of P. scandinavica collected in the wild. He was also able to get some plants from Norway and grow them in Scotland to produce seeds. Many samples of P. scotica seed were collected for him in the north of Scotland and Orkney. It was challenging work. The differences between the two types of seed were down to “small distinctions of size, ratio of length to breadth, angulation and surface texture which are difficult to put in terms of a formal description”. But in the end, after much painstaking work, his conclusion was firm and clear. There could be “little doubt” that the fossil seed was indeed from P. scotica and not P. scandinavica. He recognised that the Primula distribution opened up a huge challenge for botanists and geologists. How can it be that the nearest modern relatives of the little Primula scotica plants in their isolated Scottish sites are across in Norway? And how can the little northern plant of today have once flourished in the Cam Valley? If we’d never heard of Ice Ages, it might have been simpler. We’d look at the map showing three different types of Primula in three different parts of Europe. We’d probably conclude they’re three survivors of a once widespread plant which has diminished over time, with three separate species gradually forming as adaptations to local conditions. If further we found evidence of the plant being also in the Cam Valley 20,000 years ago, we would reckon that the separation into the different species must have happened a long time in the past. 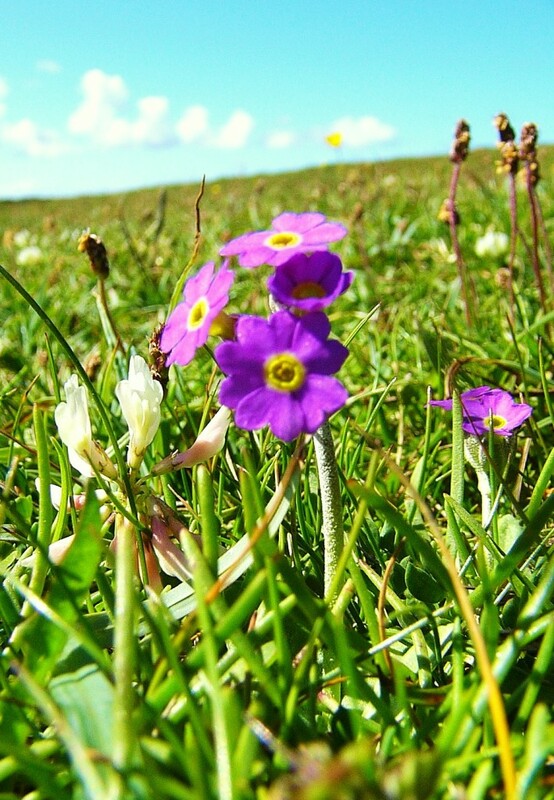 We would form a picture of the various Primula plants – among them the Primula scotica in Orkney and Caithness – being a relict species whose origins go back for tens of thousands of years. But now we must take into account the Ice Age, the period when the whole northern hemisphere was trapped in intense cold, with much of Scotland covered by a 2-kilometre-deep mass of ice. There were various periods of ice advance, each lasting many thousands of years. Around 14,000 years ago, the ice started to melt, and gradually vegetation came back. Exactly how it came back is not as clear as might appear. A picture has developed of vegetation somehow gradually creeping back, spreading slowly across the now exposed soil and debris left by the retreating ice, in a kind of slow colonisation with seeds of newly-established plants being blown ahead or carried by birds. But if that picture of post-ice colonisation was correct, then the Primula which gradually crept back northwards would have been P. farinosa; and it would have crept back along some kind of migration route, not simply have bypassed the bulk of mainland Scotland to settle in a very small and specific part of the north. The evidence of the distribution of the three types of Primula, together with Miss Chandler’s P. scotica seed from the Cam Valley, suggests that the plants are not the product of gradual colonisation after the ice, but rather remnants from an older time. But how could remnants from an older time have survived the ice? The geologists can help us. They have long pointed out that there is a big post-ice difference between mainland Scotland and Orkney. The land of Scotland is very slowly rising relative to the surrounding sea. The reason is that the earth’s continents are like rafts floating on a deeper sea, the earth’s mantle. The mantle is more or less solid – but over long periods of time it behaves like a very viscous fluid. So when ice builds up on land, it exerts a huge downward hydraulic pressure on the mantle beneath, which is slightly compressed. Then when the ice melts, the pressure on the mantle is relieved and the land above it – very slowly and over thousands of years – gradually rises. So the land of Scotland, once weighed down by a massive icecap, is now rising compared to the previously lightly-iced areas of surrounding sea. But strangely, Orkney is going the other way – slightly sinking in comparison. The logical explanation is that Orkney never had the great mass of ice that Scotland had. One of the geologists to the fore in coming to this conclusion was the late Donald Omand from Caithness, who carried out many field studies around the north and provided inspiration and encouragement to a generation of students and researchers. And as time has gone on, support for this picture has been gradually growing. In 1982 David Long of the British Geological Survey was sampling material from the seabed off Shetland, and in a core from about eighty miles east of the island of Fetlar he found a tiny piece of dark grey flint. It was no bigger than a 10p coin; but it was clear it had been shaped by human hands, and archaeologist Caroline Wickham-Jones recognised it as a scraper. The flint comes from a depth of 143 metres of water, in the area of the Halibut Bank. It was found in sediments dated to around 11,000 years ago, at a time when the area was an island, and the scraper’s location is close to the shoreline – just where we would expect to find people, living from the sea. That stimulated geologists to rethink the evidence and seek further clues to how Orkney and parts of Caithness may have looked in the most recent Ice Age. Orkney’s slow sinking, as against Scotland’s slow rise, had suggested that Orkney had, unlike Scotland, not been buried under a mass of ice, but it clearly had been cold. For a time, there was a picture of tundra, with several glaciers running through it, one of them being where the Pentland Firth is today. But now an alternative picture has been developed by two geologists who have done much work in the north, Dr John Flett Brown from Orkney and Dr Adrian Hall who lives in Edinburgh. They agree that Ice Age Orkney lacked a big ice-cap but they don’t go as far as the tundra picture. Instead they see a complex and changing picture where there are ice-flows from both Scotland and Scandinavia and the various ice-streams collide and twist and turn. It’s a much more dynamic situation than a static ice cap sitting on top of the land for thousands of years, and has scope for pockets of material to be transported by glacial action rather than simply being flattened. If we look first at the possibility of tundra, could the little Primula scotica have survived in such a harsh and barren environment? In the Arctic tundra winter temperatures drop as far as minus 50 degrees C. The soil is often frozen, with permafrost not far below the surface. Summer temperatures can rise as high as 12 degrees, and that short growing season sees a burst of activity. Plants appear in rock crevices or surface hollows. They are small, growing close to the ground, huddled together in cushion-like mats. Such tundra conditions sound hard for the little P. scotica plants of today. A long-term study by Orkney Field Club has shown that the plants are long-lived, with some surviving for twenty-five years or more, but that the weather is a factor. After milder winters, more plants survive and flower. On the other hand, they do not do so well in years with more frequent gales and higher snowfall. Still, they have survived year after year on very exposed coastal land, tucked down snugly near the ground, while bitter wind, rain, sleet and snow blow over them. And we also have Miss Chandler’s P. scotica seed from the Barnwell Pit, in an Ice Age deposit from a tundra landscape in the Cam Valley. So there is just a possibility that P. Scotica could have lived in a tundra landscape in northern Scotland; but the second scenario, survival in corners of a world in which glaciers collide and carry material, is more difficult to imagine. There is, however, an additional possibility which would apply to either of these geological situations. It was raised by ideas put forward by a retired forestry researcher, the late Mike Phillips in Moray. In his researches on the oaks of Darnaway, he suggested that they may not have emerged as a part of a gradual recolonisation spreading out after the melting of the ice, but rather as the emergence of seeds preserved frozen. His suggestion, when he first made it, may have seemed radical – but in the years that have gone by since, some incredible discoveries have been made that provide strong support. Botanists have been trying to germinate seeds found in permafrost – with remarkable results. Some years ago a Russian team discovered a cache of seeds of Silene stenophylla, a narrow-leaved campion native to Siberia, that had been buried by an Ice Age squirrel near the banks of the Kolyma River. The seeds, some mature and some immature, were unearthed from 38 metres down in the permafrost, and were entirely encased in ice. Radiocarbon dating showed they were 32,000 years old. Around them in the permafrost were layers that included mammoth, bison, and woolly rhinoceros bones. The mature seeds had been damaged, possibly by the squirrel itself. But some of the immature seeds retained viable plant material; and a team from the Institute of Cell Biophysics in the science city of Pushchino extracted that tissue from the frozen seeds, placed it in vials, and successfully germinated the plants – which grew, flowered, and, after a year, created seeds of their own. So seeds can survive, in the frozen depths of the permafrost, for tens of thousands of years and awaken when conditions change. So plants like Primula scotica could have slept like this through the long winter of an ice age and woken to new life in the eventual spring. This leaves many more questions than answers. I wish I had written down more details of Mike Phillips’s work when I had the opportunity and I wonder if anyone might have more information about it? I wish I had asked Donald Omand more about the geological picture that he built up about Ice-Age Orkney and Caithness. I wish that I had asked more about Primula scotica from one of the great botanists of the north, the late Dr Elaine Bullard of Orkney Field Club, and to ask her more about Dr Dovaston and his work. But still – if one little seed from one ancient deposit has opened the way to fresh thinking about the Ice Age and subsequent vegetation, what other seeds may be somewhere in the ground, preserved from ancient times and waiting for a researcher of today to study them and find a new clue?